We understand that sometimes you need inspiration. It can be difficult to find that perfect toy gift, so we wanted to provide you with some links back to our most popular “list” articles. These lists should give you some great toy gift ideas – and more importantly – you can see toys that are highly rated and very durable. This list is going to be updated constantly, so check back regularly! 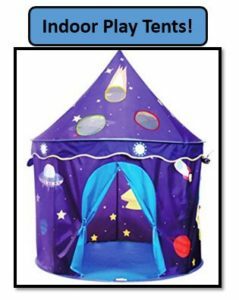 The Best Kid’s Indoor Play Tents – One of the best toys that we ever bought for our sons was an Indoor Castle Tent. The downside to indoor play tents is they take up some space (unless you buy a collapsible option) – but the upside is they provide a great play space that encourages imaginative play! Our tent is still being used multiple years after it was purchased! There are hundreds of different indoor tent options, and the article linked above highlights a wide variety of the best options. We looked at everything ranging from tunnel tents with ball pits, to themed tents, to castle tents – we wanted to highlight just how many great choices there are! This article should help you find an indoor play tent that will work for you. It also includes pictures, and it should help you find some eye-catching tents that are going to make your kids want to play inside one! 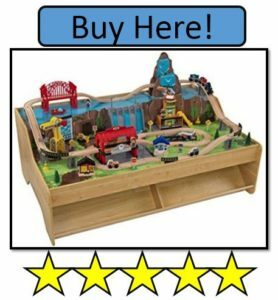 The Best KidKraft Train Tables – Train tables are a lot of fun, and KidKraft makes a lot of great options for your home. The wooden pieces are hand painted, and they often incorporate fun things into their train tables like boats, helicopters, construction equipment, and other things besides just trains. You will also have lots of different track pieces, as well as things like tunnels, trees, and signs to lively up your track! Train tables can take up a lot of space, and it is going to take you some time to put all of the pieces together, but they will provide hours of enjoyment. It is important to pick a table that fits properly into your play space to maximize enjoyment. The article linked above highlights some of the different design options and features that are included in these durable train tables – which should help you decide which train table will be the best fit for you. 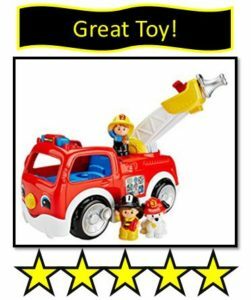 The Best Fisher Price Little People Toys – I think almost everybody has grown up with some type of Little People Toys (they first released a toy school bus in 1959) – and people love them because they create such a wide variety of options that kids can pick from (this toy line was introduced to the Toy Hall of Fame in 2016). We personally own the Little People Fire Truck, Toy Airplane, Farm Set, and Zoo Train + extra animals. If your child is interested in animals, you can find a Little People Toy set based on that. If they are interested in farming, there are plenty of Little People Farm Sets and so on. That selection is just fantastic. The article above gives you a great run down on lots of different Little People Sets – ranging from tree houses to pirate ships, you are going to find something fun for any child! It also includes pictures, so you can get a great idea of what all these fantastic toy sets look like! If you are looking for a gift idea for a child in that 2, 3, 4, 5, range – this is a great place to start! 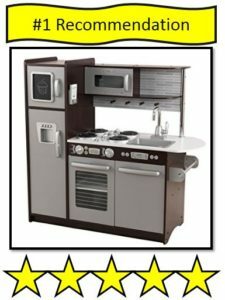 The Best KidKraft Kitchen Sets – One of the first Christmas gifts we ever bought for our son was a KidKraft Retro Kitchen Set. It has withstood a few years of “abusive” playtime – and that is because it is made from really durable materials. Now, it took me about 3 hours of time to build that kitchen set – but that is okay, the enjoyment my kids have gotten from it was worth the build time! The article linked above is on the best KidKraft Kitchen sets you can buy, and there are lots of different design options for KidKraft Kitchen Sets. They have retro looking kitchens, modern kitchens, and even “corner kitchens” which are designed to easily fit into the corner of your home. There are so many great design options that you should find something fun for your children to play with! They can be very heavy and large in size, so look at the pictures and read the descriptions closely to ensure you pick the right kitchen set for you! The Best Toddler Transportation Toys – Having two toddlers running around the house, we have found that we can never have enough toy cars, trains, planes, and other transportation toys. The article we created above was just a quick list of some of the transportation toys aimed at toddlers that we have had a lot of fun with. It is not a complete list by any means, but it should inspire some possible Christmas toy gift ideas! 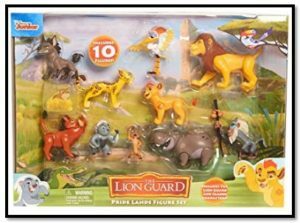 The Best Lion Guard Toys – We have actually purchased a number of different Lion Guard Toys, which is surprising because I wouldn’t consider my son to be a huge fan of the show. For children that are fans of this TV show, there are a few really cool choices to pick. For example, the Lion Guard Training Center is a huge toy with lots of platforms, buttons, noises, and cool features that children will enjoy. There are also some really cool action figure sets, board games, plush stuffed animals – basically lots of great stuff to pick from. We have had lots of fun with the action figure set & the training lair set we bought. Hopefully our list of the best Lion Guard toys gives you some fun ideas!